Even if you don't smoke, breathing in someone else's smoke can be deadly too. Secondhand smoke causes about 3,000 deaths from lung cancer and tens of thousands of deaths from heart disease to nonsmoking adults in the United States each year. Millions of children are breathing in secondhand smoke in their own homes. Secondhand smoke can be especially harmful to your children's health because their lungs still are developing. If you smoke around your children or they are exposed to secondhand smoke in other places, they may be in more danger than you realize. 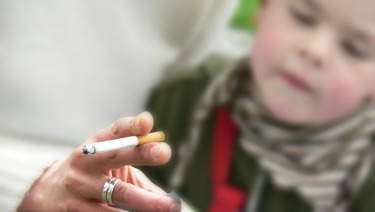 Children whose parents smoke only outside are still exposed to the chemicals in secondhand smoke. The best way to eliminate this exposure is to quit. The American Academy Pediatrics (AAP) has conducted research on the effects of thirdhand smoke and found that it is also harmful. Thirdhand smoke is the smoke left behind—the harmful toxins that remain in places where people have smoked previously. Thirdhand smoke can be found in the walls of a bar, upholstery on the seats of a car, or even a child's hair after a caregiver smokes near the child. Make your home smoke free. Until you can quit, don't smoke inside your home and don't smoke anywhere near your children, even if you are outside. Don't put out any ashtrays. Remember, air flows throughout a house, so smoking in even one room allows smoke to go everywhere. Make your car smoke free. Until you can quit, don't smoke inside your car. Opening windows isn't enough to clear the air and can actually blow smoke back into the faces of passengers in the back seat. Choose a babysitter who doesn't smoke. Even if the babysitter smokes outside, your children are exposed. Consider changing babysitters to find a smoke-free environment for your children. Encourage tobacco-free child care and schools. Help your children's child care or school, including outdoor areas and teachers' lounges, become tobacco free. Get your children involved in the effort to make schools tobacco free! It may be hard to quit. Talk with your doctor or your child's pediatrician if you need help. There are over-the-counter and prescription medicines that may help you quit. Call 1-800-QUIT-NOW to be connected to your state quitline- they can refer you to local resources and help you quit.